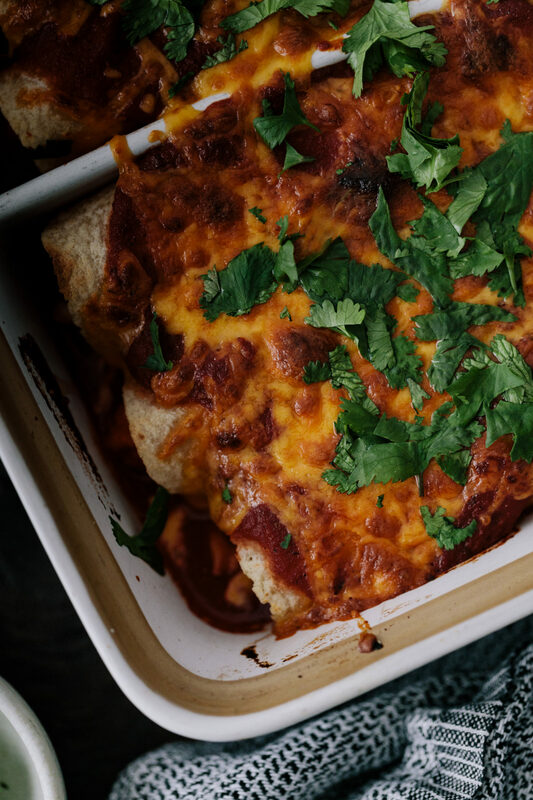 Sweet Potato Enchiladas with Spiced Pinto Beans | Naturally. 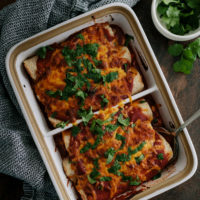 Hearty sweet potato enchiladas made with easy spiced pinto beans and a quick, homemade enchilada sauce. Preheat oven to 425˚F. Take a fork and pierce the sweet potato a few times. Place in a roasting pan and bake until tender; 40 to 50 minutes. Alternatively, you can also steam or boil peeled/cubed sweet potato pieces- just pick whichever method is easiest. While the sweet potato is roasting, combine the tomatoes and spices for the sauce in a pan. Bring to a boil, reduce to a simmer, and let cook until the tomatoes are hot enough to mash and the liquid begins to thicken, 30 to 40 minutes. Mash with a fork to break down tomatoes and stir in the cilantro and vinegar. For the beans, combine the beans, their liquid, and spices in a separate pan. Bring to a boil reduce to a simmer, and cook until the beans are hot and the liquid has thickened. Once the sweet potato is done, remove the skin and lightly mash. To assemble the enchiladas, pour about 1/3 of the enchilada sauce in the bottom of a 9×9 (or similar sized) pan. Take a tortilla, dip it in the tomato sauce to soften, then place in the pan. In the center of the tortilla, layer a scoop of the sweet potatoes followed by a couple spoonfuls of beans, and a small sprinkle of the cheese. Roll the tortilla so that it is seam-side down in the pan and repeat with the remaining tortilla/filling. Top the enchiladas with the remaining sauce and cheese. Return the pan to the oven, drop the oven temperature to 375˚F and bake until the cheese has melted and is starting to brown, about 20 to 25 minutes. 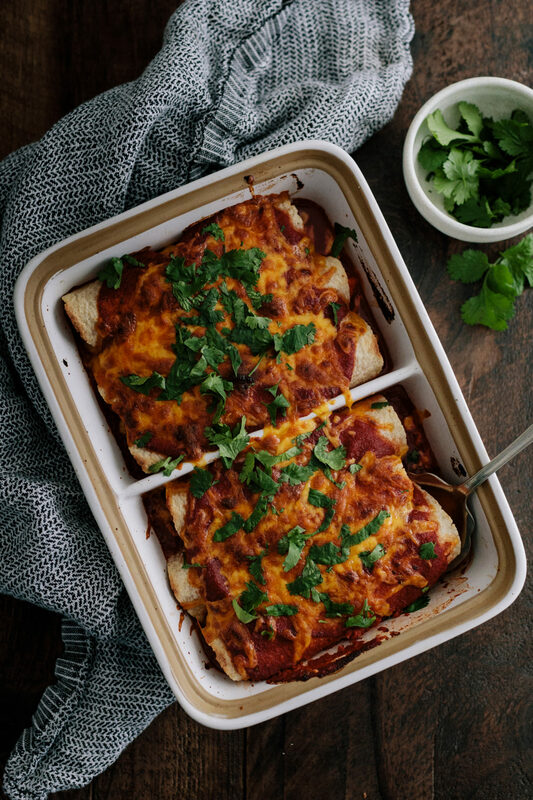 Serve the enchiladas with extra cilantro, hot sauce, and/or sour cream. 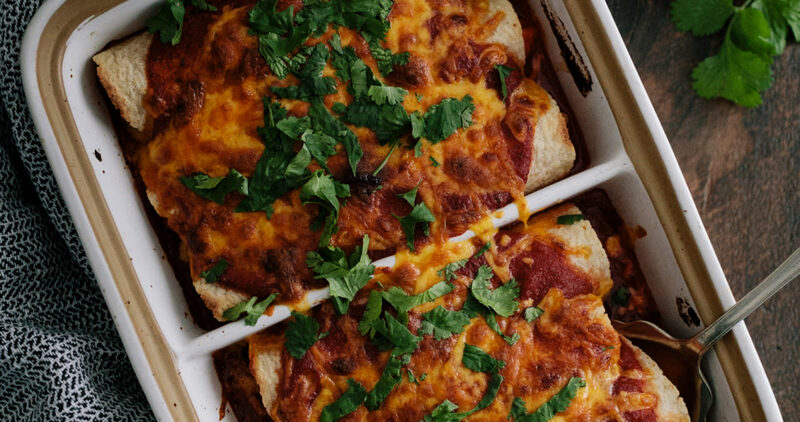 These enchiladas freeze well. Simple assemble, cover, and freeze until you’re ready to bake. Bake at the same temperature but for about 20 to 30 minutes longer. I liked the ease with which the recipe came together. Great combination of flavors. We like our enchiladas a little saucier than the recipe made, if we had made all 8 enchiladas. I made three large enchiladas for meal one, and then made bowls for the second meal, adding arroz verde as our base. Thanks! Hi there! I just put this in the oven. The length of time in the oven isn’t mentioned in the recipe. It just states until the cheese browns. Thankfully, the blog mentions the oven time as 20 minutes. Could you please update the recipe so that the timing shows up when it’s printed? Looking forward to a yummy meal in a bit! two of my favorites (sweet potato and pintos), thank you, great alternative to the default enchilada ingredients, much appreciated!